Seiji Ozawa, San Francisco Symphony Orchestra. PentaTone PTC 5186 168. As you know, PentaTone is the company that is still issuing multichannel SACD's when most of the music industry has given up the idea. PentaTone either records things new or goes back to the old Quadraphonic format of the Seventies and revives recordings originally done in four channels but often never released that way. Such is the case with this Quad recording of Dvorak's Symphony No. 9 from maestro Seiji Ozawa and the San Francisco Symphony, now on multichannel SACD. Czech composer Antonin Dvorak (1841-1904) penned his New World Symphony in 1893, shortly after he and his family came to New York for a visit of several years. When American critics first heard the work, they praised it for its elements of African American and Native American cultures, to them things that made the music "American" in nature. As it turns out, though, Dvorak said he wrote mainly music of the "common man" and used primarily Slavic folk tunes vaguely familiar to his homeland. No matter, people will forever think of the Ninth as Dvorak's "American" piece. I was never a big fan of Ozawa during his tenure (1970-77) with the San Francisco Symphony, and this recording of the Dvorak Ninth tends to confirm my opinion. He seemed to do much better when he moved along to the Boston Symphony. In any event, the opening movement, while full of energy, appears lacking in fundamental joy. It's also oddly static, never moving much beyond the same routine cadences. Ozawa never develops any rhythmic pulse, so this section comes off mostly loud and noisy rather than jubilant or exhilarating. The conductor puts a little more feeling into the Largo, with its lovely cor anglais part. However, it still doesn't convey quite the haunting, melancholy longing heard in other interpretations. The orchestra appears at their best here, though, supplying plenty of warmhearted, sympathetic support. Ozawa doesn't do a lot to put much sparkle into the Scherzo, either, which also comes off in rather humdrum, run-of-the-mill fashion. Nevertheless, he manages the finale better, starting off strong, with real emphasis. Maybe he was saving all his best shots for this last big moment. Anyway, while the finale still isn't all that inspiring, failing to catch the spirit that Kertesz, Dorati, Reiner, Macal, Kubelik, Pesek, and others do, at least it doesn't lull one to sleep. The album closes with Dvorak's Carnival Overture. The composer meant the title to suggest "youth, lust and exuberant life," and Ozawa does come close to portraying those qualities. The recording, which Decca made at Cupertino Hall in 1975, is miked closer than Decca, Philips, or RCA ever miked the San Francisco orchestra, offering a good deal of detail but at the expense of losing some depth, air, and ambience. Be that as it may, the stereo layer that I listened to is quite dynamic and well defined, with the sound opening up quite effectively. If you have multichannel SACD capabilities with your audio system, I would imagine the surround sound should be impressive. In the Sixties I owned a pair of AR-3a speakers. They produced some of the best bass of their day and a decent midrange, but the tweeter rolled off considerably, giving them a somewhat dull sound. I bought a pair of add-on tweeter arrays for them that helped considerably. In the Seventies I owned a pair of FMI J speakers, on which the designer, Bob Fulton, had placed electrostatic tweeter arrays. Again, the add-on treble support helped impressively in extending the highs. Now, I own a pair of VMPS RM40 speakers that need no high-end extension. The tweeters already sound quite smooth, refined, and well extended. However, when I saw a few years ago that VMPS's owner and designer, the late Brian Cheney, offered a pair of add-on ambience tweeters for his speakers, I thought it only appropriate that I try them out. Each tweeter unit is four-and-a-half inches square by one-and-a-half inches deep, with a built-in crossover, double-sided tape to secure it into position, and a pair of four-foot wires that connect to the binding posts of a person's main speakers. 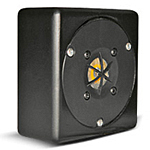 The crossover produces a steep slope beneath 7k Hz, with a top end that extends out to around 20k Hz. The units have no on or off switch, and the only way to control their output is by using a foam muffler over them. Also, while VMPS offer them for use with most of their own speakers, Brian tells me there is no reason why they can't be used with other, non-VMPS speakers as well. In talking further with Brian, he said the idea was to experiment with the units. There is no absolute perfect placement for everyone. If you place them on the rear of your main speakers facing the back wall, they can increase the ambient sound of the high end. If you place them on the rear of the main speakers facing the side walls or if you place them on the sides of the main speakers facing outward, they can increase the width of the sound field. If you place them on top of the main speakers facing upward, they can increase the height of the sound field. And, of course, if you place them on top or on the sides of the main speakers facing forward, they can augment the sound of your main speakers' high end. Then there is also the matter of how high or how low you're going to position them on your main speakers. Whew! Also, if you do decide to experiment with the placement, I suggest you keep the protective plastic strips on the tweeters' double-sided tape and use heavy-duty duct tape or Gorilla tape to fasten the tweeters to different locations temporarily. Once you fasten them permanently to the location of your choice, they could be a bear to remove. Connecting the speakers takes a couple of minutes. After that, you're on your own. I took about an hour fussing with them, first positioning the tweeters on the rear of my main speakers toward the outside edge and facing the back wall, on the same level as my regular tweeters on the front. This seemed, indeed, to increase the sense of atmosphere and environmental impact of the high end. Then I moved them around a bit, facing backwards and facing the sides. In the end, I returned to my original placements, with the add-on tweeters not exactly firing toward the back wall since I have my main speakers toed in toward the primary listening position. So the add-ons actually fire at an angle toward the back wall. Ultimately, did they make a difference? Did they effect an improvement? Yep, definitely. However, it was a subtle improvement, not a day-and-night improvement. Understand, if I were writing for a high-end journal, I'd probably say they made all the difference in the world and a person couldn't live without them. But I prefer not deal in black-and-white absolutes. The add-on tweeters make a small and pleasing difference, period, enough to warrant their use. For me, in my listening room and the way I positioned them, the VMPS ambience tweeters slightly increased the sense of airiness in the high end, slightly increased the stage width, and slightly increased the depth of the sound field. OK, I can understand why the add-ons would increase air and width, but I still don't quite understand why they would increase depth, why the sound stage would now sound deeper. I suppose I should simply not question it and let good things be. There was one thing, though: After a few minutes of early listening, I pressed my ear to one of the main speaker's built-in tweeters and then to the add-on tweeter behind it. The add-on tweeter sounded rougher to me, more spitty. However, after about eight or ten hours of continuous use, the add-ons seemed to smooth out and lose some of their initial grittiness. My advice: Let the ambience tweeters burn in for a while before judging them. Nevertheless, I still hadn't convinced myself that the improvements I was hearing weren't imagination. If I were more clever, more inventive, or more ambitious, I might have rigged up an on-and-off device that I could use from my listening position. Being none of the above, I resorted to the next best thing: a pair of washcloths and the Wife-O-Meter. I used masking tape to fasten heavy washcloths over the add-ons tweeters, cloths that my wife could quickly roll up and place on top of the units so that within seconds she could either open up or dampen the tweeters' response. I had her do this a number of times while I listened from my preferred position in front of and between the main speakers. As you might expect, I heard the sound come more to life with the cloths removed, I heard more ambient air around the high end, I heard a wider stereo spread, and I heard greater depth to the sound field. Again, big differences? No, and they were differences that most people probably wouldn't notice without the dampening test. Indeed, they are differences some people might not discern even during the test. But I heard them, and I don't profess to have golden ears. Now, to answer that question of whether they're worth it: Yes, for me the add-on tweeters were worth every penny of their $189 asking price, largely because I'm the kind of guy who is always trying to squeeze that last ounce of sound from my audio system without having to pay an arm and a leg to do it. The VMPS Ambience Tweeters afford me the luxury of slightly better sound at a modest cost. Seems like a deal to me, and if you can find a pair used, you might want to investigate them. Also, Ruy Blas Overture. Rebecca Evans, soprano; Joyce DiDonato, mezzo-soprano; the Oxford and Cambridge Shakespeare Company; Le Jeune Choeur de Paris; John Nelson, Ensemble Orchestral de Paris. Virgin Classics 50999 628631 2 4. Felix Mendelssohn (1809-1847) began work on his music for Shakespeare's play A Midsummer Night's Dream when he was still in his teens, composing the overture in 1826 when he was only seventeen. He then completed the work some sixteen years later, in 1842, while in the employ of the Prussian court. The King suggested he compose complete incidental music for a new production of Shakespeare's 1595 play, and Mendelssohn complied, with the music premiering in 1843. John Nelson directs the Ensemble Orchestral de Paris, along with the Le Jeune Choeur de Paris and members of the Oxford and Cambridge Shakespeare Company in a presentation of musical and verbal excerpts lasting about seventy minutes. Personally, I found the words merely disrupted the music, but if they suit your fancy, you get a goodly amount of them. Anyway, Nelson's way with the music is fairly routine when you compare his performance with those of Andre Previn and the London Symphony (EMI) in their complete account or Otto Klemperer and the Philharmonia (also on EMI) in their more-limited selections. Nelson's reading never seems to catch fire, never floats airily, never dances as merrily as Previn's or Klemperer's versions do. In fact, it almost appears as if Nelson just wanted to get the music over with in order to proceed with the dialogue. The famous Overture Nelson handles with efficiency rather than enchantment. "Ye Spotted Snakes" comes across well enough, if without much bite. The Intermezzo sounds fairly nice; the Nocturne a bit hurried; the "Wedding March" properly ceremonial if not too festive; and so on. 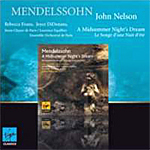 I wish I could say I liked this disc better than I did, given my love of Mendelssohn's music. However, I found Nelson's conducting just too literal for my taste and the dialogue excerpts too intrusive. Not even the accompanying Ruy Blas Overture did much for me, I'm afraid. Virgin recorded the music in December of 2001, first releasing the disc in 2003 and reissuing it in 2010. The orchestral sound is a trifle thin compared to the aforementioned Previn and Klemperer recordings. The bass is light, and the lower midrange lacks warmth. It's not a real concern given the nature of the music; I just mention it in passing. The high end is OK, though, as are inner detailing, stage depth, and dynamics. They're nothing extraordinary, mind you, just pleasant, adequate sonics. Unfortunately, the voices don't seem particularly well integrated into the rest of the production but come across as added on afterwards, which they probably were. Also, Gli Uccelli, suite. Marzio Conti, Orchestre Sinfonica del Teatro Massimo di Palermo. CPO 777 295-2. People probably know Italian composer, conductor, and musical scholar Ottorino Respighi (1879-1936) best for his suites of tone poems, things like The Pines, Fountains, and Festivals of Rome, the Ancient Airs and Dances, and the Brazilian Impressions. Despite the popularity of his music, however, or perhaps because of it, many critics have disdained his work, calling it too lightweight, too immature, too bombastic, too theatrical, or some such rubbish. The fact is, his music perfectly describes moments or people or animals or events in ways to which almost any listener can relate. It's what good music is about. First up on this disc is the ballet La Boutique Fantasque (The Magic Toy Shop), which Respighi wrote for a 1919 première by Sergei Diaghilev's Ballets Russes. The composer based much of the music on pieces previously written for piano by fellow countryman Gioachino Rossini. There is plenty of showy color in its forty-five minutes of running time as it tells the semi-comical story of two can-can dolls in a toy shop who come to life and refuse to have a pair of customers separate them. The music is as much fun as the story. Maestro Marzio Conti and the Orchestra of the Teatro Massimo play the melodies in a most-delightful manner, never trying to make more of it than what there is. It's when conductors try to take Respighi's tunes too seriously, too weightily, that things begin to sound rather ponderous and overwrought. Here, Conti keeps the mood light and lets the music charm one in a natural, unforced way. The slower interludes, like the "Dance Cosaque" and the "Valse Lente," are fluid and airy, and the faster sections, like the "Tarantella" and "Galop," are vigorous and bracing. Now, I'm not suggesting that La Boutique Fantasque is either high art or trifling cotton candy for the ears. It is neither. It is simply breezy ballet music meant to do nothing more than entertain, which it does with unqualified ease. Accompanying La Boutique Fantasque is the little suite Gli Uccelli (The Birds). Again, Respighi uses music previously written by others to describe four kinds of birds: the dove, the hen, the nightingale, and the cuckoo. They are mostly whimsical representations of these feathered friends, meant to evoke a smile. 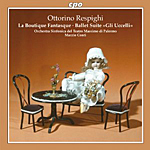 Originally, Respighi intended them for a small ensemble, and while it may appear at first as if the Teatro Massimo Orchestra is a trifle too large a group to do justice to the delicacy of some of the music, Conti and his players bring it off nicely (although I admit to a small preference for the recording by the Orpheus Chamber Orchestra in this work). 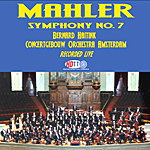 CPO recorded both pieces in July, 2007, at the Teatro Massimo, Palermo, Italy, in multichannel SACD surround. Maybe that's why there is a very slightly foggy sound to the midrange when playing back the disc in its hybrid two-channel mode. Even so, it's hardly a noticeable or objectionable qualm, and the rest of the spectrum is exemplary, with crisp, sparkling highs, decent bass, and a wide front-channel spread. Add in some strong dynamics, good percussion work, a modest stage depth, and only the faintest background noise, and the result is a big, open, most-pleasing sonic landscape. A closing note: I tried, unsuccessfully it seems, to read the booklet comments on Respighi and his works, but I found it pretty tough sledding. Maybe if you try, you'll have better luck than I did understanding just what the author was getting at. Also, Vocalise. 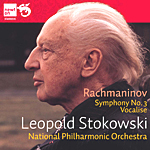 Leopold Stokowski, National Philharmonic Orchestra. Newton Classics 8802024. One of the advantages of being a reviewer is the joy of discovery. Of the many discs I get to audition each month, not all are interesting enough to mention at the site and only a relative few jump out and demand serious attention. Such a recording is Stokowski's Rachmaninov Third Symphony. The old maestro premiered the work in 1936, but it wasn't the hit the public expected it to be after the success of the Second Symphony. Stokowski never conducted the piece again until he recorded this performance in 1975, just two years before his death. Originally, I believe the Desmar label released it on LP, and then in 1998 EMI made it available on CD. Now we get it from Newton Classics in what appears to be the same master EMI used. So if you already have it on EMI, this one is identical. I had never heard the recording before EMI sent it to me in '98, and it was a pleasure hearing it again recently on Newton Classics. It only takes about two minutes of listening to realize that here is something special, an unqualified recommendation with no if's, and's, or but's. The interpretation is, to say the least, highly idiosyncratic (it is Stokowski, after all), and it may not appeal to everyone grown accustomed to a more traditional approach. The Third contains none of the big, memorable themes of Rachmaninov's more overtly Romantic Second Symphony, one of the reasons it often comes off by comparison as rather humdrum and rambling. At best, say under Previn (EMI) or Ashkenazy (London), conductors have made the Third sound lush, if not always exciting. Under Stokowski, however, the Third takes on new dimensions, imbued with a passion I've never found in it before. I've heard it said that in Stokowski's last years, when he was in his nineties, he never really had much to do with his own recordings, that the recording studio merely propped him up in front of an orchestra to wave his hands and lend his name to the production, and that technicians in a control booth later assembled the real performance. I'd say this recording puts the lie to that contention. No studio technician could have come up with the continuously challenging tempo variations, inflection changes, and rhythmic nuances that Stokowski fashions here. The first-movement Allegro holds unlimited surprises, the slow-movement Adagio is conservative but committed, and the third-movement Allegro vivace is truly exhilarating. After his first performance of the work, Stokowski had almost forty years to think about it further. Maybe the years helped. What's equally important, though, is the disc's excellent sonic quality, recorded by engineer Bob Auger. There is nothing of the typical studio production about it--nothing of the up-close, ultra-analytical, multi-miked, highly defined, feel-the-air-around-the-instruments characteristics so beloved of hi-fi demo enthusiasts. It merely sounds like a live orchestra. Nor is there a tremendously wide stereo separation, but, rather, the natural spread of an actual orchestra set back a short distance behind one's speakers, slightly elevated, in a conventional quarter circle. There are no sections unduly highlighted, no sudden forward placement of instruments, no holes in the sonic structure, nothing untoward in the sound at all, which in itself makes it stand out for its realism. Of course, all of this sonic pleasantry could merely be serendipitous, a fortuitous match between my system and this particular recording. If so, lucky me. It continues to be one of the best discs I've listened to in quite a while. Sir Simon Rattle, Berlin Philharmonic Orchestra. EMI 50999 6 46385 2 2 (2- disc set). It's occurred to me over the last few years that Simon Rattle had more snap and pizzazz back when he was leading the City of Birmingham Symphony Orchestra than he has shown conducting the Berlin Philharmonic since 2002. I'm not sure why, but I have a couple of theories: (1) Rattle is older now, more mature, and his performances reflect that aging process. (2) Working with one of the world's most-prestigious orchestras, he feels a need to take everything more seriously. (3) He has done a lot of his recording work in Berlin live, and maybe that has forced him to be more cautious. (4) I just like the more youthfully exuberant spirit of his earlier period because I personally enjoy a more joyous, uninhibited sound. (5) Maybe I'm just wrong, and my minority opinion reflects a callowness on my part. I dunno. In any case, Rattle seems to have let his hair down a little more than usual here in The Nutcracker, and at the same time let his inner child loose. Or perhaps it's just the nature of the music to sound enchanting under every baton, even Rattle's more conservative one these days. 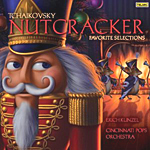 As you probably know, Peter Tchaikovsky (1840-1893) adapted his two-act ballet The Nutcracker from E.T.A. Hoffman's story "The Nutcracker and the Mouse King," premiering the ballet in 1892. He didn't like it. Indeed, friends said he loathed it, especially compared to his previous ballet, The Sleeping Beauty. It's ironic, then, that in our own time, The Nutcracker has become possibly Tchaikovsky's most-popular, nay most-beloved, work. Certainly, it's got a little something in it to delight everyone. 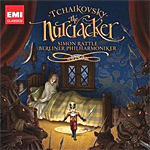 Rattle takes the "Miniature Overture" very gently, very delicately, promising a sweet, fairy-tale Nutcracker to follow. Then he opens things up considerably in the "March" and the "Children's Galop." Overall, this is a strongly nuanced performance, with Rattle the child, yes, but the thoughtful child. It's in the big dance and waltz sections, though, that Rattle shows us his best stuff. He performs them on a grand scale, with a wonderfully forward pulse. The "Grandfather's Dance" is light and sprightly, and "The Waltz of the Snowflakes" that closes Act I is innocent and charming. Rattle presents the various "Divertissement" selections in Act II with plenty of color and character and a good deal of poetic vigor as well. I also enjoyed his handling of the momentous "Waltz of the Flowers," "Dance of the Sugar Plum Fairy," and "Pas de deux," his injecting them with the utmost grace and suavity. They are not as passionate as some renditions, yet they are wondrously refined. Other, more-dramatic scenes, like "The Battle" and the "Trepak: Russian Dance," come off with an abundance of appropriate bombast and swagger. Hair down or no, however, Rattle is still going to give us a serious reading of the material. So, if anything, he elevates the music of The Nutcracker from the Christmas candy counter to something approaching high art. And, needless to say, as well, the Berlin Philharmonic play magnificently. EMI's sound, recorded in 2009 at the Philharmonie, Berlin, is ultrasmooth, well extended, and beautifully balanced top to bottom. It's among the nicest-sounding recordings I've heard from Rattle and the BPO in years. Bass is deep, highs glisten, and the midrange is reasonably clear, with a decent stage depth. While the sound is a trifle soft, yes, and lacking in ultimate detail, sparkle, and transparency, it is nonetheless realistic, providing a middle of the concert-hall feeling. However, because of the wide dynamic range involved, the output is fairly low, so turn it up carefully. Drawbacks? Well, the only thing EMI offer here is the complete Nutcracker, which lasts a little over eighty-six minutes, spread over two discs. Other sets offer better value with their companion pieces, like Dorati's mid-priced Philips package, which includes a suite of highlights from The Sleeping Beauty on the second disc. Besides which, there is formidable competition to consider in complete sets not only from Dorati (Philips and Mercury) but from Previn (EMI), Ashkenazy (Decca), and Dutoit (Decca). Still, you'll get a plush, cultured, yet festive reading from Rattle, making it a contender no matter how you look at it. Marc Minkowski, Le Musiciens du Louvre, Grenoble. Naive V 5234. First a minor note: I don't think I'm the only person who enjoys a good-looking album cover. I often find myself staring at a well-illustrated disc jacket or booklet insert and daydreaming about the connection between the picture and the music. For instance, the Mackerras album of Handel's Water Music for Telarc features a gorgeous painting of "A View of London and the Thames," with what I take to be the King's golden barge floating down the river with his entourage of attendant vessels. One can almost hear Handel's music floating along with them. 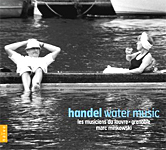 The present Naive disc of Handel's Water Music features a black-and-white cover picture of two people in a rowboat. Maestro Marc Minkowski leads his period-instruments group Le Musiciens du Louvre, Grenoble, France, in mostly lively interpretations of the three familiar suites of Handel's Water Music. The Musiciens du Louvre are a fairly large body of players for a period-instruments band, forty-one performers named in the booklet but around sixty-five pictured in a booklet photograph. I don't know if all of them participated in the album, but even a group of over forty is unusual these days for a period-instruments performance. Nevertheless, the number of players here does come close to representing the number described in contemporary accounts of the Water Music première event. As you probably know, King George I ordered up the music in 1717 for a gala river party he organized. In a letter to the King of Prussia, the ambassador Friedrich Bonet provided these details: "Along side the King's barge was that of the musicians, fifty of them, who played all sorts of instruments, to wit trumpets, hunting horns, oboes, bassoons, German flutes, French flutes, violins and basses; but there were no singers. This concert was composed expressly by the famous Handel, a native of Halle and first composer of the King's Music. His Majesty so approved of it that he had it repeated three times, even though it lasted an hour on each occasion: twice before and once after supper." Needless to day, the forty-odd players of the Louvre present a large-scale rendition of the music, appropriate to the stature of the tunes written for a king, even though the readings do lose a little something in intimacy compared to rival productions. For period-instruments performances, they are surprisingly plush and smooth. If there is anything not here, though, I kind of missed the drums found on several other recordings, authentic to the original performances or not. 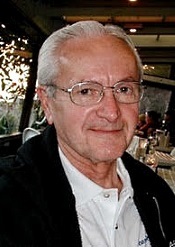 Plush or not, Minkowski and his team produce mostly zesty interpretations. Whether they are more accurate to Handel's intentions than other readings probably no one can say. Handel doesn't seem to have left any autograph scores, so we only have the evidence of a couple of eyewitness testimonies and a few manuscripts dated years later. I say "mostly zesty interpretations" because Minkowski performs the first two suites in moderation; that is, he is never excessively fast or slow. The exception is the little Suite in D major, HWV 349, where he varies the tempos considerably more than most other conductors. Anyway, in both cases, they are admirably well played. Accompanying the Water Music we get an instrumental suite--an overture and several short dances--from Handel's first opera, Rodrigo, premiered in 1707. While I would have preferred hearing the more-commonly coupled Music for the Royal Fireworks, the music from Rodrigo makes a suitable companion piece. The sound, which Naive recorded in January, 2010, is among the best you'll find in this music, especially considering the relatively large-sized ensemble involved. The sound combines warmth and clarity in equal measure for a realistic listening experience. The hall exhibits a natural ambient bloom well caught by the audio engineers, and there is a reasonable degree of stage depth to add to the stereo spread. I can't imagine anyone complaining about the sonics. Also, Nocturnes Nos. 4, 5, 7, and 8; Ballade No 1; Polonaise No. 6. Maurizio Pollini, piano; Paul Kletzki, Philharmonia Orchestra. EMI 50999 6 31780 2 9. My Random House Unabridged Dictionary defines "classic" as "a work of the first rank, esp. one of demonstrably enduring quality; an artistic production considered a standard; a work that is honored as definitive in its field; something noteworthy of its kind and worth remembering; one that is considered to be highly prestigious or the most important of its kind." 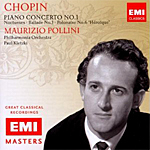 One might easily apply all of those meanings to Maurizio Pollini's 1960 EMI recording of Chopin's Piano Concerto No. 1 in E minor, Op. 11. Frederic Chopin (1810-1849) was only around twenty years old when he wrote his two Piano Concertos, writing the Concerto we know today as No. 2 before he wrote No. 1, but publishing it later, thus giving it the misleading number 2. So, if Concerto No. 1 seems more mature and has become more popular, it's because it wasn't Chopin's first attempt in the genre. And the reason I mention the composer's age when he composed the piece is because Pollini was only eighteen when he recorded it, shortly after he won the International Ettore Pozzoli Piano Competition in Seregno, Italy (1959), and the International Chopin Competition in Warsaw, Poland (1960). Youth serves youth. In the first movement, Pollini is in equal measure poetic and heroic without an ounce of sappiness, a movement that comes through all the more powerfully for its straightforwardness. When Pollini executes the famous main theme, it, too, flows effortlessly with a gentle, expressive, unforced charm. I suppose you could call it a restrained passion, which makes it all the more passionate. Chopin himself described the second movement Romanze as "...calm and melancholy, giving the impression of someone looking gently towards a spot which calls to mind a thousand happy memories. It is a kind of reverie in the moonlight on a beautiful spring evening." Such is Pollini's interpretation, which lingers dreamily in the moonlight as much as any other account, the pianist striking every note with uncluttered assurance and conveying a mood of unlimited tranquillity. Pollini floats the melody along in the most lyrical possible manner, yet never drawing attention to anything but the music. Finally, in the closing Rondo Vivace, Pollini produces an interpretation both playful and vigorous, his unaffected technique dazzling and persuasive. Pollini recorded the accompanying solo works in 1968, and they lend an added value to this mid-price bargain. The solo pieces include the Nocturne No. 4 in F, Op. 15, No. 1; Nocturne No. 5 in F sharp, Op. 15, No. 2; Nocturne No. 7 in C sharp minor, Op. 27, No. 1; Nocturne No. 8 in D flat, Op. 27, No. 2; the Ballade No. 1 in G minor, Op. 23; and the Polonaise No. 6 in A flat, Op. 53, "Heroique." They demonstrate the pianist's range in Chopin interpretation, from the most quiet and serene pieces to the most bravura. EMI recorded the Concerto in 1960 at Abbey Road Studio No. 1 and remastered it using Abbey Road Technology in 2001, releasing it at the time in their "Great Recordings of the Century" line. This newly released, 2010 edition in the "EMI Masters" series uses the same 2001 mastering, so if you already have it, you don't need to buy it again. For those of you new to it, I assure you it is a must buy. The sound is remarkably strong, clear, robust, and dynamic for its age (or for any age). The piano sparkles, well focused and crisply defined. The orchestral support spreads out behind the piano like an extension of the solo instrument itself, with respectable transparency, air, or depth. EMI recorded the accompanying short pieces in Paris eight years later, again reproducing the sonics quite well, cleanly and warmly. Should I also mention that this recording of the Concerto is about my absolute favorite recording of anything, anywhere, any time. It is perfect. 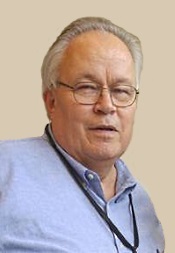 Trevor Pinnock, European Brandenburg Ensemble. Avie AV 2119. 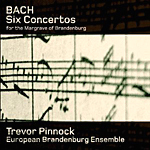 There was already a plethora of Brandenburg Concertos discs on the market before Trevor Pinnock recorded them for the first time with his English Concert in the Eighties. But his recordings rightly soared to the top of many critics' lists of recommendations for their vivacity, enthusiasm, authentic performance practices, and admirably clear sonics. So why would he convene an all-new cast of period-instruments performers in 2006-07 to rerecord them for Avie? My first thought was pretty cynical: I wondered if he didn't want to capitalize on the popularity of his earlier set to sell a new one to curious fans. Fortunately, my cynicism proved unfounded. These new Brandenburgs are sufficiently different and sufficiently better recorded to warrant a listen. Indeed, they may even surpass Pinnock's first set. In the booklet notes, Pinnock explains that "eager to cut through any narrow conceptions of period style I invited players from different countries and of different generations to join my new voyage of exploration." With Pinnock directing from the harpsichord, the new performances appear more relaxed than his older ones, although never lax. You remember that Bach's Brandenburg Concertos sound different from one another because the composer never meant them to be a cohesive group. Margrave Christian Ludwig of Brandenburg commissioned Bach to write several pieces for him, and what he got a few years later was a collection of six works for various-sized ensembles and various solo instruments that Bach had probably composed at various times for various other occasions. More or less. Concerto No. 1 is among the longest of the Brandenburgs and arranged for the biggest ensemble. It is also my least favorite. Under Pinnock it is one of the most gently played and subdued renderings I've ever heard of the work. All seventeen of Pinnock's players become involved, the "hunting horns" rotating with solo violin for prominence in the movements. The dances in the final section flow gracefully, fluidly, regally, rather than knocking us on our head. Concerto No. 2 is among the most popular of the pieces and highlights the oboe, recorder, violin, and trumpet, the latter getting in some good playing time. It is the bounciest of the six concertos, but unlike the breathless readings of some of Pinnock's rivals, this interpretation races forward at a leisurely pace, yet without ever losing its forward thrust or momentum. What's more, the slow middle movement sounds more wistful than ever. Listeners probably know Concerto No. 3 as well as they know No. 2, maybe even more so. Here, Pinnock and his crew are lively and vibrant without being tiresome or stressful. More than in the other concertos, No. 3 is pure ensemble work, and the players work wonderfully well together, producing a single force. The brief second movement, improvised on violin, makes a fitting bridge to the sparkling Allegro that concludes the piece. Concerto No. 4 is Bach's most playful, with the soloists darting in and out of the structure, Pinnock's team making the most of it in a winning display of virtuosity. However, the two recorders and the violin never overstay their welcome and present a happy and delightful compromise throughout the work. It's a sweet and lovely performance all the way around. Concerto No. 5 is another of my personal favorites, highlighting solos from the violin, flute, and, unusually, harpsichord. One of the smallest ensembles, eight players, ensures a greater clarity of sound. Again, Pinnock emphasizes a lightness and grace in the work, things sometimes missing from his earlier account, as well as from most accounts in general. Nevertheless, the playing is skillful in the extreme and never fails to dazzle in its beauty, refinement, and execution. While Concerto No. 6 is for me the least distinctive work of the set and uses the smallest ensemble, seven players, it doesn't feel small. It's only real deficiency is its similarity to Concerto No. 3, though taken at a much slower pace. Pinnock and his people offer as light a touch here as before, not giving up too much sparkle along the way. The sound, which Avie recorded in 2006 and 2007 at the ballroom of the Sheffield City Hall, Sheffield, England, and at the Henry Wood Hall, London, is warmer and smoother than Pinnock's earlier sessions. As before, the players appear moderately close up, and the degree of transparency involved varies with the size of the ensemble and the location of the recording. Mostly, though, it is quite good, quite realistic, with enough ambient bloom to provide a feeling of one's being in the audience. It's an easy-listening sound rather than a distinctly audiophile one, and for this music it works beautifully. With its moderate yet invigorating speeds, its precise yet stylish playing, and its warm yet lifelike sound, the Avie Pinnock set of Brandenburgs seems an ideal top contender in a crowded field. It's probably the one I'll be listening to for a very long time. Two minor, non-musical concerns before leaving, however: The discs come housed in a cardboard-and-plastic, foldout Digipak container, which I dislike. If you happen to break the spindles or other plastic parts, you're out of luck for a case. It's not as if you can easily just put everything back into a new jewel box, unless you want to devise some makeshift artwork for it. The other thing is that Avie have chosen to arrange the concertos with the odd numbered ones (1, 3, and 5) on disc one and the even numbered ones (2, 4, and 6) on disc two. I don't suppose this makes any real difference since Bach never meant for performers to play the works sequentially, but to find things more easily, I would have preferred a simple chronological order. 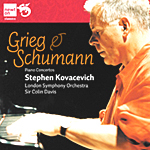 Stephen Kovacevich, piano; Colin Davis, BBC Symphony Orchestra. Newton Classics 8802019. On the list of grand, classic piano concertos, one finds fewer entries than one may think: the Beethoven "Emperor" Concerto, of course; the Tchaikovsky First, the Rachmaninov Second and Third, and the Grieg and Schumann works, to name a few that pop off my head first. The latter two concertos often seem to find themselves coupled together, probably because of their similar styles and relatively brief playing times. Anyway, since the early Seventies I've been listening mostly to two recordings of the Grieg and Schumann concertos, one by Radu Lupu, with Andre Previn and LSO (Decca or LIM), and this one by Stephen Kovacevich, with Colin Davis and the BBC Symphony Orchestra. Lupu provides the sheer brute strength and Kovacevich adds the poetry. Philips originally recorded Kovacevich, and the company has released it on LP and CD several times. Now in 2010 we get the recording reissued by Newton Classics. It can't hurt. To quote from the Newton Classics Web site, the company is "a Dutch based record label, founded in 2009. Its vision is to return old friends to the classical music lover, and these friends are all fantastic recordings being sourced from the vaults of major record labels. Most of the recordings which are being issued by Newton Classics have not been on the market for quite a substantial length of time, often more than ten years." Since in this case Philips have not released the Grieg and Schumann performances in quite some time, it's nice to see them back in a fresh new package. Maybe it will serve to introduce a new generation of music lovers to these treasured performances, music lovers who somehow missed them the first few times around. Edvard Grieg (1843-1907) wrote his Piano Concerto in a minor, Op. 16 in 1868, no doubt modeling it in part on Schumann's earlier concerto. After a towering introduction (which even non classical-musical listeners will recognize) on the largest scale, the first movement settles into a melding of lyricism and bravura, both of which Kovacevich handles with consummate ease. In the Adagio, the pianist is at his very best, presenting the music with a hushed, rhapsodic intensity. Then, in the playfully infectious finale with its reflections of a popular Norwegian dance tune, Kovacevich and Davis make the most of their virtuosity with a well-nigh perfect interplay of pianist and orchestra. Robert Schumann (1810-1856) wrote his Piano Concerto in A minor, Op. 54 in 1841, revising it in 1845 in the form we know today. It likely inspired Grieg, who, as I've said, probably based his own concerto on at least the first movement's structure. While Kovacevich plays the entire work with much grace and sensitivity, he never misses the lofty gestures. The piece doesn't have the drive of the Grieg concerto, although Kovacevich carries it out with such authority, it feels bigger and weightier than it actually is. Again, the soloist and orchestra play as one, an ideal combination. Philips recorded the music in 1970-71, and in the company's final release of it (2006) they used a remaster in 96 kHz, 24-bit processing as part of their "Originals" series. This 2010 Newton Classics reissue appears to use the same master, although on direct comparison I noticed some minor, largely inconsequential differences. The Newton Classics disc is quite clear, clean, and vivid, with a wonderfully robust, lifelike presence. The piano is front and center, sturdily reproduced, the orchestra realistically spread out behind the soloist in a room-filling acoustic. It doesn't get much better. 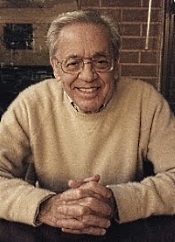 Erich Kunzel, Cincinnati Pops Orchestra. Telarc SACD-60674. The title of this disc says that it contains "favorite selections," which is probably true but implies that it is like a suite or something. It's not. At 73 minutes, the disc contains about 85% of Tchaikovsky's complete ballet score. It actually leaves out only two of twenty-two scenes, numbers five and seven, and preserves all of Act II intact. That's pretty good measure, if you ask me. Kunzel seems to run hot and cold, sometimes producing invigorating readings, other times not so energetic. These Nutcracker selections are mostly in the invigorating category, although there are times when the conductor seems positively leaden, he's so foursquare. Fortunately, the big scenes come off well, with plenty of pizzazz. I wish I could say the same for the sound on this SACD, but it, too, runs slightly hot and cold. On the hot side, the SACD stereo layer can be enormously dynamic, so much so that you may find yourself turning the volume up and down and few notches. The bass has plenty of punch as well, sometimes enough to knock you back on your couch. Moreover, the stereo spread is wide and orchestral depth is moderate. On the cold side, the midrange is not quite so transparent as it could be, and the treble seems a bit recessed. These characteristics are most noticeable upon direct comparison to other recordings, in my case to those of Andre Previn (EMI) and Antal Dorati (Philips), both of whose recordings show more sparkle, if not more thrust. Incidentally, this is a hybrid disc with three versions of the program on it: one in regular stereo, one in SACD stereo, and one in SACD multichannel. Accordingly, I also listened to a few minutes of the regular two-channel CD stereo layer, and it seemed very marginally less dynamic to me. I believe that is as it should be. Bernard Haitink, Concertgebouw Orchestra. HDTT HDCD190. 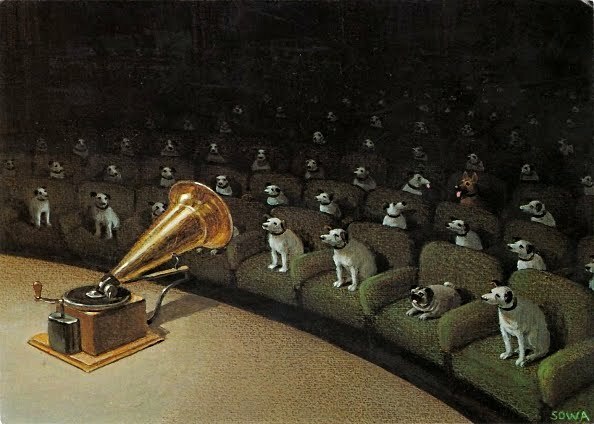 During the Seventies and Eighties, the heyday of the audiophile, when the major record companies were releasing a ton of great classical recordings every month, there were three conductors who reigned supreme: Herbert von Karajan and the Berlin Philharmonic (DG), the more glamorous of the bunch; Georg Solti and the Chicago Symphony (Decca), the more dynamic of the group; and Bernard Haitink and the Concertgebouw (Philips), the more literal. Looking back, I certainly have favorite recordings from each of these men, but the conductor whose recordings give me the greatest continued pleasure today is Haitink. I suspect it's because he did the most to let the music speak for itself, and his recordings tend to wear the better for it. It was in the mid Eighties that I had the pleasure of hearing Haitink and the Concertgebouw in person playing the Mahler Seventh Symphony. It was, I thought, a rather low-key rendition, yet one of the most persuasive I had ever heard. So it delighted me to see that HDTT, who transfer older recordings in the public domain to disc and to upload, had remastered a version of the Seventh with Haitink from the Eighties that I had not heard before. (He has recorded it two or three times now, with the version I like best being an early recording available only in a complete box set from Philips.) The version we get here is one HDTT transferred from a live radio broadcast tape and probably represents something close to what I heard live. The Fifth, Sixth, and Seventh Symphonies form a middle trio of Mahler symphonies, all of them purely orchestral, with the Seventh being the oddest of the group. Even more so than most of Mahler's works, its five movements are open to multiple interpretations, and with seemingly every conductor on the planet anxious to record them, we get the piece in a variety of readings. I remember one critic long ago remarking that the symphony was actually a recounting by Mahler of his trip to the countryside, complete with his packing the suitcases, traveling along the rural roads, along the pastures, and on to his destination. Whatever, I wasn't quite buying it. Haitink takes the long opening movement at a measured pace, patiently, lyrically, moving through the first two-thirds of it before becoming more animated and insistent. The second movement is the first of two "Nachtmusik" sections flanking the central Scherzo. Haitink invests the curiously marchlike rhythms of the first one with an appropriately eerie quality, the cowbells playing a less prominent role than in other performances. After that, Haitink plays the Scherzo in fits and starts, Mahler requesting the movement to sound "shadowy and not fast." Haitink ensures that it is a fitting follow-up to the preceding movement, if anything a little creepier. The second of the "Nachtmusik" segments Haitink handles more delicately than the more bizarre first one, this time as a kind of romantic serenade. It's a beautiful and all-too-brief intermission in the otherwise eccentric goings-on. Then both Mahler and Haitink cut loose in the Rondo-Finale, the most extravagant and vivacious portion of the symphony, although I have to admit the conductor tends to rein things in a tad too much for my liking. Mahler allows everything we've heard previously to come into play--from horns to cowbells to Wagner--and I would have enjoyed hearing Haitink having a little more fun with it. The sound, recorded live in 1983 and transferred by HDTT (High Definition Tape Transfers) from a two-track radio broadcast tape, is more close-up than most Philips Concertgebouw recordings. As such, there is not as much of the ambient concert-hall bloom we usually hear from this source. Instead, we get a bit more orchestral depth and a slightly stronger impact in the music. Although there are times when one might wish there were a bit less upper-bass overhang, generally speaking this is clean, reasonably clear reproduction, with a wide stereo spread and a realistic presence. Because the recording derives from a live performance, there is some inevitable audience noise--coughs and wheezes and the usual applause at the end--but none of it is particularly distracting. I'm not sure this recording would displace my previous top choices in the Seventh; I still like Haitink's earlier Philips recording, Solti's electric Decca rendering, Abbado's exciting DG account, and Inbal's steady, dependable Denon product. But for fans of Mahler and/or Haitink, this live recording has the advantage of reliable playing and good sound. What's more, the HDTT disc (or download) is the only version of this particular Haitink performance currently available. Also, Schumann: Piano Concerto. 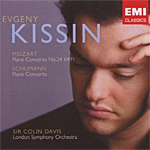 Evgeny Kissin, piano; Sir Colin Davis, London Symphony Orchestra. EMI 946 3 82879 2 6. Certainly, there is no questioning the skill, sensitivity, and bravura of pianist Evgeny Kissin or the equally skilled work of conductor Sir Colin Davis and the London Symphony Orchestra. So, maybe it's a matter of first impressions. Things begin on this disc with the Mozart Piano Concerto No. 24, which is a fairly dark work for the composer. But it seems as though EMI's live concert recording (Barbican Hall, London, November, 2006) makes it doubly dark, tending to make the orchestral accompaniment sound veiled and murky in the big opening and closing movements. The orchestral sound is dynamic enough, to be sure, with a solid bass response, but the midrange comes out rather beclouded in terms of inner detail. To double check, I put on Murray Perahia's account with the English Chamber Orchestra on Sony for comparison, and I found it much more vibrant and to my liking. Fortunately, this shrouded condition of the EMI effort does not affect the piano, which EMI apparently miked closely enough for it to hold its own. So, Kissin's handling of the middle, slow movement comes off quite nicely. The Schumann Piano Concerto fares better, probably because it is more lithe to begin with, and, therefore, the orchestra is less of a hindrance. Also, Colin Davis has had enough experience in this work to give it its due (remember the wonder of Kovacevich's recording with Davis and the BBC Symphony on Philips), whereas in the Mozart, Davis and Kissin seem fractionally more sluggish. Anyway, EMI had the sense not leave any applause in the recording, and the audience is admirably quiet throughout the proceedings. That's a blessing right there. It is with great sadness that we reflect upon the death of the great Australian soprano Dame Joan Sutherland, known by her legions of fans as "La Stupenda," who has died at the age of 83. October 11, 2010: The sheer breadth and variety of recordings Joan Sutherland made over more than 30 years recording for Decca is impressive by any standard. They include 40 recordings of 33 different operas, as well as operatic highlights, anthologies and specially conceived collections of music ranging from baroque rarities to selections from operetta and songs by Noel Coward who was a personal friend. 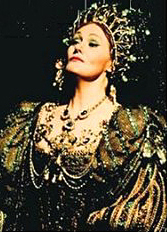 Joan Sutherland's unique association with Decca began in 1959 with an LP of opera arias that included two scenes from Donizetti's Lucia di Lammermoor. It was in this role that she had rocketed to international stardom overnight, when Franco Zefirelli's Covent Garden production premiered on February 17, 1959. A complete Decca recording was made in 1961 under Sir John Pritchard, and a second recording, conducted by her husband and mentor Richard Bonynge and featuring Luciano Pavarotti was made in 1971. During her career Joan Sutherland sang the role of Lucia 233 times. Joan Sutherland's connection with Decca was first established in 1958 with Handel's Acis and Galatea, which appeared on the company's L'Oiseau-Lyre label, and during the late 1950s and 1960s both she and Richard Bonynge (they married in 1954) were at the forefront of the Handel revival. It was during Venice performances of Handel's Alcina in 1960 that a journalist first dubbed her "La Stupenda." In 1960 Joan Sutherland recorded what can only be described as one of the most famous vocal recitals in the history of the gramophone, The Art of the Prima Donna. Conceived and devised as a homage to prime donne of a bygone era, the album (released on two LPs) became an instant best-seller, won a Dutch Edison Award in 1961, and has never been out of the catalogue. It was also in 1961 that Joan Sutherland won a Grammy for the best classical performer of the year. Decca sends its deepest appreciation and condolences to her husband Richard Bonynge and their son Adam. Gunter Wand, Munich Philharmonic Orchestra. Profil PHO6014. Just a month before receiving this 1993 live Profil recording from Gunter Wand and the Munich Philharmonic, I reviewed Sir Colin Davis's 1996 live recording of Schubert's Ninth with the Staatskapelle, Dresden, also from Profil. So, Profil seems to be on a live Schubert Ninth kick from the Nineties. Not that I'm complaining; both recordings are quite nice. Indeed, the two recordings are more than nice, and you could hardly go wrong with either of them. I mean, unless you had them side by side as I did, you could hardly tell them apart. Davis's disc is slightly warmer in tone, and Davis plays the symphony at a marginally faster tempo. Otherwise, contrasts, lyricism, lilt, solemnity, joy, and excitement abound in equal measures in both performances. If you remember, the Great C major Symphony was something of a change of pace for Schubert; it was bigger, broader, and moodier than anything he had done before, his earlier symphonies, including the "Unfinished," comparatively gentle and light. The C major gives way to a more massive structure and more serious themes, yet it contains a wealth of memorable tunes one after another, giving it the advantage of being open to varied interpretations. In Schubert's own day, people deemed it unplayable, unfortunately, and Schubert would never hear it performed. Like Davis, Wand plays up both the weighty and the lyrical elements of the work. The interpretation is relaxed yet serious. He plays up the sprightly parts while maintaining a weighty decorum. Unlike Davis, however, Wand takes a more measured, almost solemn approach to the second movement Andante, which, nevertheless, provides a good juxtaposition with the energetic Scherzo that follows. By the time Wand reaches the big finale, the boisterous Allegro vivace, he is as rousing as any conductor of any age. Also like Davis's recording, I doubt I would have identified it as live except for the unfortunate eruption of applause at its conclusion. The sound for Wand is not quite so velvety smooth as for Davis, nor does it have as comforting a bass, but it is clear and fairly clean. 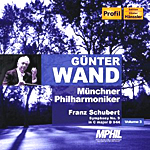 As I say, you can't go wrong with Gunter Wand in the Schubert Ninth, especially as he has recorded it several times before, and this one is as good as the best. Includes the Piano Concerto in A minor; Ballade; Lyric Pieces. Leif Ove Andsnes, piano; Mariss Jansons, Berlin Philharmonic Orchestra. EMI 0946 3 94399 2 8. One often thinks of the Piano Concerto in A minor of Edvard Grieg (1843-1907) as big and brawny, a common misconception, of course, based on the way the work begins. 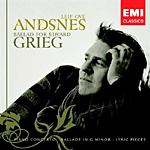 But it contains a good deal of lyrically poetic material, too, and those are the parts emphasized by pianist Leif Ove Andsnes in this reissue of his 2002 recording. The present disc, Ballad for Edvard Grieg, which EMI released several years ago, commemorates the one-hundredth anniversary of the composer's death. Andsnes provides a wonderful performance of the Piano Concerto, a little less grand and weighty than some other interpretations, but subtle and nuanced, bringing out all the flavor of the Norwegian composer's refinement and grace. The reading may not surpass those of Kovacevich (Philips) or Lupu (Decca or LIM), but it's in the same league and a bit more meditative. The mood of the Piano Concerto complements the companion works, too, the Ballade in G minor, newly recorded, and the Lyric Pieces, six of Grieg's sixty-six miniature tone poems for piano that Andsnes recorded in the drawing room of the Grieg Museum in 2001, using Grieg's own piano. Further augmenting the excellent performances is EMI's sound, which in the Piano Concerto is close enough to provide detail and force, yet distant enough to provide a degree of pleasant ambient bloom. If anything, the EMI engineers handle the solo piano pieces even better; they sound quite natural, quite realistic, and quite well defined. Includes Don Juan, Dance of the Seven Veils, and Till Eulenspiegel. Otto Klemperer, Philharmonia Orchestra. HDTT HDCD157. 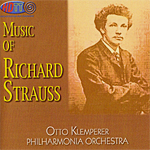 Richard Strauss (1864-1949) was among the last of the great Romantic composers, although his music leaned a little more toward the modern age in his final years. In the late nineteenth century he was wowing audiences with his symphonic poems, compositions often based on literary and philosophical underpinnings. They were mainly large-scale works, utilizing all the resources of a full-blown symphony orchestra and then some. Occasionally, he even employed additional devices like wind machines in his orchestral works before his moving off into the operatic field. On this remastered HDTT disc, Otto Klemperer and the Philharmonia Orchestra provide performances of three fairly early pieces, starting with his brief orchestral treatment of the legendary Spanish nobleman Don Juan, known for his many sexual conquests. Strauss had written a number of other works before Don Juan in 1888, but it was this one that pretty much clinched his popularity. It's brash and swaggering music, like its hero, the kind swashbuckling music that years later probably inspired composers like Erich Wolfgang Korngold (The Sea Hawk) and John Williams (Star Wars). Under Klemperer, the music for Don Juan loses a bit of something in overall bite, the electricity not quite flowing as readily as it does under several other notable Strauss conductors like Fritz Reiner (RCA), Bernard Haitink (Philips), and my personal favorite, Rudolf Kempe (EMI). By comparison, Klemperer's broader pace tends to drag. However, he makes up for any lack of energy in his usual fastidious shaping of the music, giving it a strength and solidity one finds nowhere else. In the "Dance of the Seven Veils" from Strauss's opera Salome, Klemperer is more in his element, where the conductor's spacious tempos actually work to produce a sensuous and seductive mood. It is really quite effective. Finally, Till Eulenspiegel's Merry Pranks is here a rather leisurely affair, building slowly. Klemperer does not seem particularly interested in the young man's boisterous adventures so much as reflecting upon them. Still, the conductor adds a good deal of impish humor to the mix (he was not always the solemn gentleman of his photographs, as witness his delightful recordings of Mendelssohn, Haydn, and Schubert). So this Till eventually brims over with mood and charm, right until the title character meets his fateful end. The back cover says that HDTT transferred these early Sixties' performances from an Angel 4-track tape. You'll remember that's what the folks at HDTT (High Definition Tape Transfers) do. They find the best possible commercially available tapes (and occasionally LP's) of older stereo material and use the most demanding audiophile equipment to reproduce them for CD, DVD, or download, as you choose. In this instance, the sound of the HDCD is exceptionally smooth, with a wide dynamic range and reasonably good midrange clarity. The sonics are a little softer than in some other HDTT transfers I've heard, yet you'll find an excellent stage depth and a pleasing degree of ambient air and atmosphere. If you were expecting something bright and edgy from Klemperer in this time period, you won't find it here. This is very natural, unforced sound, quite easy on the ear. Oddly, HDTT offer no information on the producer, engineer, or recording date for the album, nor any track timings. For the record, however, I believe the producer was Walter Legge, the engineer Douglas Larter, and the recording dates 1960-61. The timing for Don Juan is 16:57, for the "Dance of the Seven Veils" 9:00, and for Till Eulenspiegel 15:00. One-stop shopping solution for classical CDs and digital downloads from more than 50 major and independent labels at Ariama.com. Enhanced search tools make buying music easier and more enjoyable. New York, NY, October 5th, 2010. Sony Music Entertainment launched the public beta for www.Ariama.com, a new on-line store dedicated to classical music that revolutionizes how fans can discover and conveniently acquire classical music on the Web. Offering music from more than 50 major and leading independent labels, Ariama is an elegant one-stop destination for CDs, high-quality MP3s, and lossless digital downloads. Ariama optimizes the on-line buying experience by combining this unrivaled convenience and choice for purchasing recordings with powerful new search and discovery tools designed specifically for the needs of classical music shoppers. The site's rich search function extends beyond the limited track/artist/album filter options and offers users the ability to browse and filter music by important elements like composition, period, instrumentation, conductor, ensemble, and soloist. "We are thrilled to announce the beta launch of Ariama.com," said Thomas Hesse, President, Global Digital Business, U.S. Sales, and Corporate Strategy, Sony Music Entertainment. "We think classical consumers are an important under-served segment of the music buying population, and we have designed Ariama as the answer for fans experiencing an increasingly difficult time finding compelling retail options for classical CDs and downloads. As a company that is home to one of the world's richest classical music libraries, Sony Music understands the unique requirements of the classical music consumer, and we have tailored Ariama to meet them." In the coming weeks, as Ariama further develops the service, additional content and features will be added to the site. Major brand partnerships within the classical music world also will be announced. Already Ariama features exclusive editorial features, record recommendations, and artist interviews, as well as content from partnerships with leading publications including Gramophone and BBC Music Magazine. Ariama.com represents the new standard for classical music commerce on-line. With its deep selection of music, compelling search tools, and valuable recommendations, Ariama is an ideal shopping environment for everyone from the new classical fan to the knowledgeable collector. The Nation's Favourite Classical Music. Various artists. EMI 50999 6 31600 2 4 (3-disc set). Bits and pieces. Bits and pieces. EMI Records Ltd. is one of the biggest and oldest record companies in the world, obviously with an extensive back catalogue of prestigious artists and orchestras to draw upon. 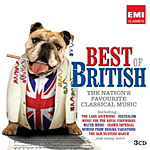 In this mid-priced, three-disc CD set, the company offer the listener forty-four selections of popular British classical music. Of course, none of it lasts very long. Each piece is either a short work or a single movement of a longer work. That's about what we expect from a best-of collection. It's a little frustrating to a guy like me who wants to hear more of the same thing rather than quickly moving on to something else, but a judicious use of the programming buttons on one's remote can at least produce a welcome hour or so of favorites. I'm not going to bore you by citing every track in the set, but let me at least mention a few of the things that stood out for me, beginning on disc one, track one, with Vaughan Williams's "The Lark Ascending," featuring David Nolan, violin, and Vernon Handley leading the London Philharmonic. The 1985 recording may not displace Hugh Bean, Sir Adrian Boult, and the New Philharmonia in the work, but it's close. My only question: Isn't it an odd choice to begin the collection? Wouldn't a rouser like the second selection below have been a more appropriate opener? Anyway, next we have "Jupiter" from Holst's The Planets, Simon Rattle's 1981 recording with the Philharmonia Orchestra. I think it's better than Rattle's later recording with the Berlin Philharmonic, although I would have preferred hearing Previn or Boult in this music. After that we have the composer most represented in the set, George Frideric Handel, born German but a naturalized British citizen whom the British call their own. We get bits from his Messiah, like the "Hallelujah Chorus" from 1967 with Sir Charles Mackerras, the Ambrosian Singers, and the English Chamber Orchestra, extremely well recorded. Later, the set offers more of Handel with segments of the Water Music, the Royal Fireworks Music, and others from various artists. In maybe the best reading ever of Edward Elgar's Enigma Variations, we find Sir Adrian Boult and the London Symphony at the top of their form in 1971 with the "Nimrod" movement. Then we hear Vernon Handley and the Royal Liverpool Philharmonic in two top-notch interpretations of Vaughan Williams's Fantasia on a Theme by Thomas Tallis and Fantasia on Greensleeves, both from 1991. Even though I don't quite like Handley's 1981 version of Elgar's Pomp and Circumstance March No. 4 as much as those of Boult or Barbirolli, it's almost a toss-up, so who's to quibble. Disc two of the set contains slightly less-familiar fare, but not by much. I greatly enjoyed George Butterworth's "The Banks of Green Willow," in a bucolic treatment by Neville Dilkes and the English Sinfonia, recorded in 1971. After that is a must, Elgar's orchestration of Hubert Parry's "Jerusalem," with the Goldsmiths' Choral Union and Owain Arwel Hughes leading the Royal Philharmonic Orchestra, recorded in 2003. The sound is a bit forward and bright, but it doesn't interfere too much with a fine performance. Then Hughes returns with the Halle Orchestra doing Handel's "Arrival of the Queen of Sheba" in a lively account from 1984, followed by another wonderful choice with Boult and the LPO in 1977 doing William Walton's Crown Imperial March. Among the goodies on disc three we get Vaughan Williams's English Folk Song Suite in a charming performance from Vernon Handley and the Royal Liverpool Philharmonic from 1991, followed by an equally appealing rendition of Elgar's Chanson de matin, Op. 15, with Lawrence Collingwood and the Royal Philharmonic, recorded in 1964. It's always good to hear Eric Coates's The Dam Busters March again, this time done up in a zippy, 1977 reading by Sir Charles Groves and the Royal Liverpool Philharmonic. Just as stirring is Arthur Davison and the Wind Virtuosi of England in a 1970 recording of "La Rejouissance" from Handel's Royal Fireworks Music. Next, we find a performance of Richard Addinsell's Rachmaninov-like movie music, the Warsaw Concerto, performed by Daniel Adni, piano, with Kenneth Alwyn and the Bournemouth Symphony Orchestra from 1980, a performance that has long been the Wife-O-Meter's favorite in this work. It is quite lovely. I've only just scratched the surface of the compositions represented, but I should not conclude without mentioning Frederick Delius's "On Hearing the First Cuckoo in Spring," a product practically owned by Sir Thomas Beecham but in this 1986 recording played sympathetically by Richard Hickox and the Northern Sinfonia of England; and "Land of Hope and Glory," the finale of Elgar's Coronation Ode, done up regally in 1977 by Sir Philip Ledger, the New Philharmonia Orchestra, and half of England. The sound on the three discs varies, of course, as one might expect from recordings that span some four decades. Yet most of the sound is excellent: very transparent and clean, with plenty of air around the instruments, good transient response, frequently deep bass, and well-extended highs. While it's not quite audiophile-quality sound, it's more than up to the occasion. You say your favorite British music isn't here? Surely, one can quibble about the contents of the set. What, no Pomp and Circumstance March No. 1? No "Rule Britannia"? No "God Save the Queen"? Nothing from Gilbert and Sullivan? Oh, well, at least EMI give it a shot. Alex Sop, flute; Seth Baer, bassoon; Michael Clayville, trombone; Nico Muhly, piano; Nadia Sirota, viola; Logan Coale, bass; Young People's Chorus of New York. Bedroom Community Record under license to Decca Music Group, Ltd. Decca B0014742-02. 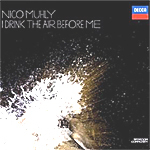 After listening to one of Nico Muhly's earlier albums of largely spiritual choral music, A Good Understanding, this disc of the composer's modern dance music, I Drink the Air Before Me, came as a bit of a shock. As is his wont, Muhly composes parts of the program for chorus--the beginning and the end--but this time the musical accompaniment is sparse and very dynamic. Indeed, it is often the contrasts between the percussive bass, flute, bassoon, trombone, viola, and piano and the sweetness of the Young People's Chorus of New York that are most astounding. Moreover, during purely instrumental segments, the contrasts among the instruments themselves are what stand out most strikingly. Mr. Muhly writes in the liner note, "I Drink the Air Before Me is an evening-length score for Stephen Petronio's dance piece bearing the same name. Inasmuch as it was celebrating Stephen's company's 25th anniversary, the piece wanted to be big, ecstatic, and celebratory. Our initial meeting...yielded a sketch...Start small, get big! The rules: a children's choir should begin and end the piece. The work should relate to the weather: storms, anxiety, and coastal living. A giant build-up should land us inside the center of a storm, with whirling, irregular, spiral-shaped music and irregular, spiral-shaped dancing." Yes, start small, get big. Indeed, it does. Yet, if anything, it starts big, the opening notes practically jolting the listener out his seat. Nevertheless, the music, divided into a dozen episodes, does get bigger and more ambitious as it goes along. Here are the names of the twelve selections, their descriptive titles saying a lot about the nature of the music making: "Fire Down Below," "First Storm," "Salty Dog," "Varied Carols," "Music Under Pressure 1 - Flute," "Music Under Pressure 2 - Piano," "Jagged Pulses," "Music for Boys," "Music for Gino," "Music Under Pressure 3 - Ensemble," "Storm Center," and "One Day Tells Its Tale to Another." There are some wonderfully rhythmic sections along the way, "Salty Dog" and "Jagged Pulses" in particular; and some others have a lovely, graceful, almost old-fashioned lilt to them, the lengthy "Varied Carols," for instance. At the center of the work are the three movements labeled "Music Under Pressure," in which the music spirals upward, as the composer says. Then, the piece comes to a climax with "Storm Center," a little like Beethoven's storm in the Pastoral Symphony, before subsiding into the elegance and beauty of the final, choral movement, which Muhly tells us comes from Psalm 19. In all, it's a fascinating composition, well played and well executed, that should reward the listener upon repeated hearing. The studio sound, I assume recorded in 2010 since the Digipak case says Muhly copyrighted the music in 2010, is quite vivid, with excellent transient response and clarity. The instrumentalists are arranged pretty much in a straight line before us, with the chorus seemingly behind them, which may or may not represent the actual arrangement of the performers. In any case, the result is impressive and makes listening to the sonics almost as enjoyable as listening to the music. Also, Schumann: Symphony No. 4. Josef Krips, London Symphony Orchestra. HDTT HDCD187. 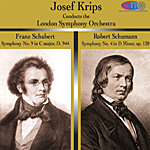 The first recording I ever owned of Franz Schubert's Ninth Symphony was this one by maestro Josef Krips and the LSO. I came to it a little late, sometime around 1970, and found it on a London Stereo Treasury LP. Unfortunately, the vinyl was rather scratchy and noisy, and while I enjoyed the performance enormously, I couldn't enjoy the sound. Then, years later, Decca issued it several times on CD, and with these releases the problem was that the sound was bright and edgy. Again, wonderful performance, but questionable sonics. So it's with enthusiasm that I can tell you how much of a relief it is finally to hear the recording in the best version I've yet to find, this one from High Definition Tape Transfers, the little company that gives us the best possible CD sound from older tapes, and in this case, LP's. More about the sound in a moment. First, a few notes about the music and the performances. Schubert wrote his Symphony No. 9 in C major in 1828, the year he died, and it premiered after his death. Consequently, he never heard it performed in his lifetime. He would have liked Krips's rendering, though. Under Krips, the opening movement may not be as weighty as Klemperer's or as zippy as any of Mackerras's recordings, but it strikes a happy balance. More so than either of those conductors, good as they are, Krips is more playful and lilting, his rhythms always bringing delight to the spirit, if not a downright smile to the face. Although the second-movement Andante, with its faintly gypsy overtones, can in other interpretations tend to drag, it's not so with Krips, who keeps the beat moving forward at a commendable pace. Yet he also maintains the movement's staccato-like cadences in good humor. Still, it's in the Scherzo the we really see Krips shine, his performance exhibiting so cheerful a glow, it makes most other conductors seem positively funereal by comparison. Then, in the Finale, Krips comes through with a combination of light airiness and energetic bounce that cannot fail to charm. While this is a fairly long symphony, Krips leaves one wanting to hear even more, which is pretty much what you might want to do--listen again. And again. The companion piece on the disc is Robert Schumann's Symphony No. 4 in D minor. Schumann actually wrote it as his second symphony, but he wasn't happy with it, set it aside for a decade, and revised it after he had composed his Symphony No. 3. Thus, we get what started out as No. 2 as No. 4. Schumann's symphonies, with the possible exception of No. 1, the "Spring Symphony," are generally a little heavier than Schubert's, yet Krips offers No. 4 in a somewhat more-lighthearted manner than most other conductors. He certainly makes a case for connecting the work of Schumann and Schubert. Nevertheless, his is a warm, cozy reading that should not displease anyone. Decca recorded the Schubert piece in 1958, and HDTT transferred it to compact disc (or download) from a London LP. One hears a modicum of background hiss and a faint low-end noise, noticeable only in select and quietest passages. There is also a very wide dynamic range involved and a reasonably strong impact. Needless to say, it is not as bright or edgy as the Decca CD's I've owned, even if it is still a bit forward in the upper midrange. The sound is exceptionally clear, with little or no transient fuzz or distortion. Now, to be honest, I still prefer the sound of the Klemperer disc (EMI-Toshiba) most of all for its greater overall smoothness; however, this HDTT disc gives it some strong competition. The Schumann symphony, recorded in 1956, two years earlier than the Schubert, is, if anything, even clearer, warmer, smoother, and better balanced than the Schubert, if marginally so. They both make easy listening for music lovers and audiophiles alike.